Investing in a safe as a security tool is a great option for homeowners and business owners who want to take advantage of a little extra security. In many ways, safes help elevate basic security measures that might be in place by providing property owners with an additional, secure, means of keeping most of their valuables protected and out of sight. There are many types of security safes, and a wide array of locking options that property owners can choose from. All safes share the common denominator of having a locking mechanism. The strength of the locking mechanism itself varies, but safes made by the top 5 safe companies are usually a cut above the rest in terms of security. The functionality of the locking mechanism is directly proportional to its level of security. A safe lock that is not working the way it was intended, could not possibly help keep your valuables secure. It goes without saying that if there is something wrong with the safe locking mechanism, it will have to be addressed before the problem balloons out of proportion. Neglecting to repair or replace a safe lock after you notice it is faulty places your valuables in danger and jeopardizes your security. Now would be a good time to point out that a safe lock replacement is not only necessary when there is a problem with the locking mechanism. This article will take a look at some of the reasons why a safe lock replacement is even necessary, and it will explore the options that property owners can take to have their safe locks replaced. Why is a safe lock replacement necessary? A safe lock replacement or a gun safe lock replacement can become necessary for multiple reasons. Remember, safes are used to store valuable items, which often makes them a prime target for criminals and burglars who are looking to score big. As a matter of fact, most first-time safe buyers usually purchase safes to store jewelry, guns, or important business and financial documents. If burglars and criminals attack your safe, there is a good chance that you might need to have your safe lock replaced. A damaged safe lock is one of the main reasons why a safe lock replacement becomes necessary in the first place. 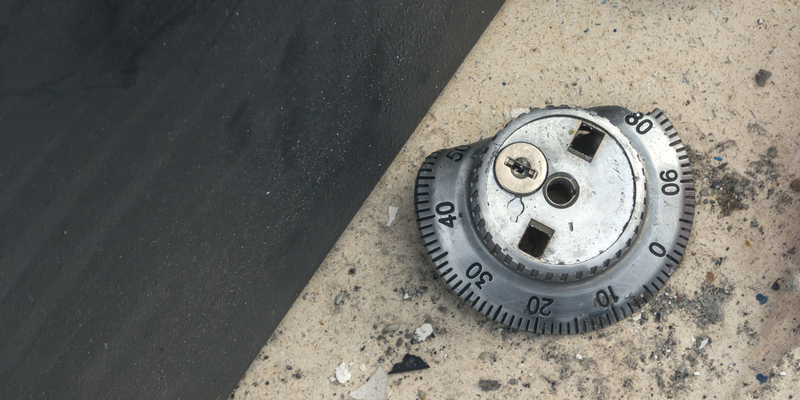 The lock to a safe can be damaged as a result of a blunt force attack, locking bolts being knocked out of alignment, or damage to the internal wiring. Not every one of the instances calls for a safe lock replacement. In some cases, a locksmith can help open your safe without having to replace the safe lock. In order to determine this, the safe will need to be fully assessed beforehand. Also, if you forget the combination to your safe, there is a possibility that your safe lock will have to be replaced. The outcome depends on whether or not some portion of your safe lock is damaged during an attempt to open it. The need for increased security is often a driving force that influences property owners to carry out a safe lock replacement or gun safe lock replacement. Some property owners might prefer to have a certain type of safe lock over another, which would prompt them to want to go through with a safe lock replacement. For instance, some owners would prefer to have a mechanical lock over an electronic lock. This is a common occurrence among gun safe owner’s and commercial property owners who might feel that more security is necessary to guard their valuables. Another issue that might elicit a safe lock replacement is the simple case of poor safe maintenance. Many people often forget to regularly service their safes and ensure that the safe is in prime working condition. Instances like this often lead to malfunctions with your safe lock. If your safe lock bolts jam in a way that causes irreparable damage to your safe lock, you will likely have to get the lock replaced. As we touched on, a safe is a security investment. As such, proper care and maintenance can go a long way to decrease the likelihood that you will need a safe lock replacement. What are the best options for a safe lock replacement? Good question. With multiple options at your disposal, it helps to know how they each compare to one another, so you choose the one that best fits your needs. The first thing that needs to be done is simply identifying the fact that you need to even replace the locks on your safe. If you are not an oblivious property owner, then you are already on the right track. As the name suggests, a locksmith is capable of handling most lock related issues. Locksmiths are very adept at helping customers with safe lock replacements, and they are usually accustomed to working with both homeowners and commercial business owners. A residential locksmith can help with issues that come up with your residential safe. A commercial locksmith can attend to commercial safes etc. While locksmiths are able to successfully work on most safes, it should be noted that the extent of your safe lock replacement will determine whether or not a locksmith is the right choice for you. Although safe locksmiths are highly trained and skilled, they are not suited for working on all safe related concerns. This is often because the problem might require knowledge of a replacement part that only the manufacturer has access to. A locksmith is more than capable of carrying out a safe lock replacement for a homeowner or business owner who simply wants to change their safe’s locks. Some safe owners are more comfortable using a mechanical lock to operate their safe, rather than using an electric one. A locksmith is well equipped to handle these kinds of conversions and safe lock replacements. In some cases, the locksmith will be able to provide you with an alternative locking mechanism to your safe, but most property owners already have their replacement lock picked out and ready to go. Calling a locksmith to work on a safe in any capacity usually starts at $65 and continues to go up based on the services rendered. However, this service is much cheaper than having to go out and buy a brand new safe. It is also much more convenient than having to deliver your safe to the manufacturer for it to be worked on. The beauty of safe locksmiths is that they are mobile, and they come to you at your point of need. However, just because the locksmith is coming to you does not mean you are off the hook. Property owners will still need to provide the locksmith with pertinent information about their safe, and the replacement lock they want to be installed. This will prevent the locksmith from walking into the job blind. Another viable option for a safe lock replacement involves reaching out to the manufacturer or distributor of your safe. This is usually a good option for property owners who are not looking to convert their locks or replace the existing lock with a different model. Outreach is suited for property owners who simply want a working model of the lock they currently have installed on their safes. For situations like this, it always helps to call the manufacturer first to see if your safe is under some kind of product warranty. If your safe is under a product warranty, it often means that your safe lock replacement will come free of charge, or at a discounted rate. However, this is only a viable solution for safe owners who are completely comfortable with the lock that was already installed. They might merely want to change it due to some damage the lock must have suffered. Safe manufacturers are also capable of conducting conversions and safe lock replacements. However, navigating this can be tricky. If you want to convert an electronic safe lock to a mechanical safe lock, the manufacturer should be able to help. You will most likely be pigeonholed into selecting a brand of lock that they offer. An issue like this really stifles the property owners ability to customize their own security and choose compatible safe locks that they are interested in. This limits the locking options that are available to people who might want to replace their safe locks, or switch out their locks for their gun safes. This option is for the property owner who is much more DIY oriented than the average person. Replacing a safe lock on your own can be tricky to navigate, but some property owners would prefer to circumvent the locksmith and the manufacturer (I’m assuming for their own personal satisfaction). Allow me to say this, if you are not DIY savvy, I believe that your best bet would be to call a safe locksmith who is much more seasoned in handling these issues. Although there are great online tutorials, it is still not an easy task. For those homeowners who want to replace the locks on their own, there is quite a bit of work that needs to be done. First, you will have to ensure that the replacement lock is compatible with your safe. The layout and mechanics of all safes are different. Although some safes might look similar, residential safes, commercial safes, and gun safes, all differ. Once you have identified a lock that is compatible with your safe, you will have to remove the old safe lock and mount the new safe lock into the recess on the safe. However, before you can even begin doing that, you will have to purchase the replacement lock. Some of these locks can be purchased from the manufacturer or reputable online distributors. If you are converting from a mechanical lock to a digital lock, you will have to rewire the safe to work with the new lock. On the other hand, if you are installing a mechanical lock in place of an electronic safe lock you will have to strip away all electronic components. It is also a very time consuming process, which is why it is often better left to the experience of a locksmith or a manufacturer. Safe lock replacement or gun safe lock replacement does not have to be hard. In a nutshell, all you have to do is identify the type of help you need, and figure out which one of the above options is the best choice for you. The most common safe lock replacements are often conversions from an electronic lock to a mechanical one. Regardless of what you need to get done, contacting a locksmith or the manufacturer is the most efficient way to go.